South Korea's first astronaut is going to be Yi So-yeon (also written Lee Soyeon), a biomechanical engineer. Yi will be just shy of 30 when she rides the Space Shuttle Russian Soyuz spacecraft to the International Space Station, replacing Sally Ride as the youngest astronaut to date. In fact, according to Wikipedia, her doctorate was conferred less than two weeks ago, on February 2. Watch part 2 of the interview, where she talks about training in Russia, the comments of "netizens" about her appearance (which she takes in good humor), and finishing her dissertation. Yi's enthusiasm seems a far cry from the macho astronaut stereotype. (There's supposed to be a part 3, but it doesn't look like it was ever posted). Yi replaced male roboticist Ko San, who was removed after he "took reading material out of the center without permission in September and lent a book without authorization in February." Wow, strict. I think the full back story on this is probably a lot more interesting, speaking as a female scientist with some exposure to Asia. Korean males tend to think the sun rises and sets on their *ss and the entire society is one of the most patriarchal on earth. My guess is that the male astronaut really made a nuisance of himself to anger the Russian hosts like that. Plus knowing the Koreans, they chose a woman runner-up so they could look progressive all the while 'knowing' she would never actually go into space. I guess that choice backfired for them ;). I think this will be a landmark occasion especially for Korean women who are constantly subjugated by their society. So-Yeon will do a great job and maybe some Koreans will start thinking twice about their attitudes on women in science. This is very exciting. Thanks for sharing! She will be launching in a Russian Soyuz, NOT a US space shuttle. Anonymous: Thanks for the clarification. I should have figured that out by the fact she was training in Russia. I would like to see her on a NASA Manned Space Mission in the future. 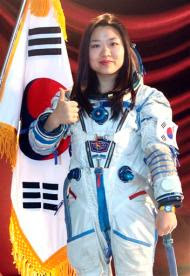 God Bless You Yi So-Yeon on the very best of sucess on being an Astronaut.